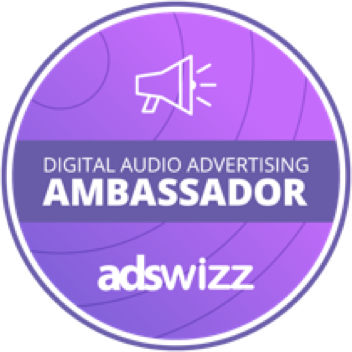 The Digital Audio Advertising AMBASSADOR is a unique, first of its kind accreditation for digital audio enthusiats at AdsWizz. It is currently granted to AdsWizz team members. The certification represents the validation of one’s understanding of AdsWizz Platforms for both Publishers and Advertisers. It requires in-depth knowledge of AUDIOMATIC - DSP, AUDIOMAX - SSP, AIS, SDK, Interactive Ad Formats, AUDIOMETRIX and Audio Ecosystem. Attend the AdsWizz Product Onborading courses. Work with AdsWizz platforms on a regular basis. Master key knowledge about our Products, our Clients and the Audio Ecosystem.